Christian Santelices believes that experiencing nature first hand has the power to transform people’s lives. As a fully certified IFMGA/UIAGM Mountain Guide, professional photographer, public speaker, writer, and community activist, his career has been dedicated to helping facilitate this process. 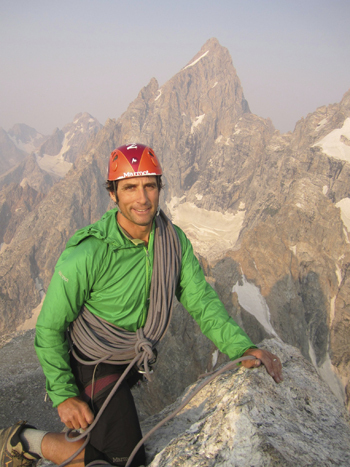 During the summer months you’ll find him working in the Tetons as a Chief Guide for Exum Mountain Guides. The rest of the year he teaches avalanche courses, ski guides, and leads custom adventures and corporate community building and leadership development retreats worldwide through Aerial Boundaries. As activist, Christian dreams of creating a global community by engaging groups from around the world in common conservation efforts. To this end he established the Global Community Project (GCP), a non-profit organization that combines outdoor education, service learning, and cultural exchange for students and professionals. The GCP provided the very first sustainable trail building course to the rangers of Torres del Paine National Park, Chile. In 2008 he brought Jackson Hole high school students to Chilean Patagonia where they teamed up with local youths, researchers, and conservationists to work on trail building projects and participate in a study of the endangered huemul deer. Christian has made notable first ascents of big walls in Patagonia including The Dream (VII 5.10 A4+) on the East Face of Cerro Escudo in Torres del Paine National Park and numerous first ascents in the Sierra Nevada, California. With three friends he did the first (and only) ascent of twenty of Steck and Roper’s “Fifty Classic Climbs of North America” in a single twenty-day enchainment. As a guide, Santelices has led numerous expeditions to Patagonia, Aconcogua, Peru’s Cordillera Blanca, the Alps of Switzerland, Italy and France, South Africa, the Pyranees of Spain, the Atlas Mountains in Morocco, Fiji, Alaska, and México. He has been featured skiing and climbing in numerous film, television and print articles, including two Warren Miller films (Journey and Impact). Christian lives in Teton Valley with his wife Sue Muncaster, daughter Mariela and son Nico.